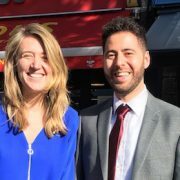 Cllr Georgia Gould, the relatively new leader of Camden Council, was out and about in West Hampstead this week. She’s visiting each ward across the borough specifically to meet the groups that make Camden tick. She was in our ‘hood with Cllr Phil Rosenberg visiting the Sherriff Centre, which impressed her. “It’s unbelievable. I’ve never seen anything like quite like it before,” she said. She also met with the Friends of West Hampstead Library, the Maygrove & Iverson Road residents assocation, Sidings Community centre, the NDF and WHAT (to jointly discuss step-free access at the tube station), JW3 and West Hampstead Life. Georgia Gould being shown round sunny West Hampstead by Cllr Phil Rosenberg. Keith Moffitt, co-chair of the NDF and himself a former leader of the council, already knows Georgia and was encouraged by her interest in the tube station, adding that “she has a young friendly manner, but is highly competent”. This was echoed by Sue Measures from Sidings who said “she seems very genuine,” and enjoyed having the opportunity to openly discuss some issues affecting Sidings. Over at that Library, Jennie Cohen, FoWHL secretary, said that “in all the years that the Friends group has existed – we’re celebrating their 20th anniversary next year – we have never before been visited by a leader of Camden Council, so it gave us all a real boost.” Monica Regli, chair of MILAM was also impressed; “It felt like she was listening, was interested – and took notes(!)’. 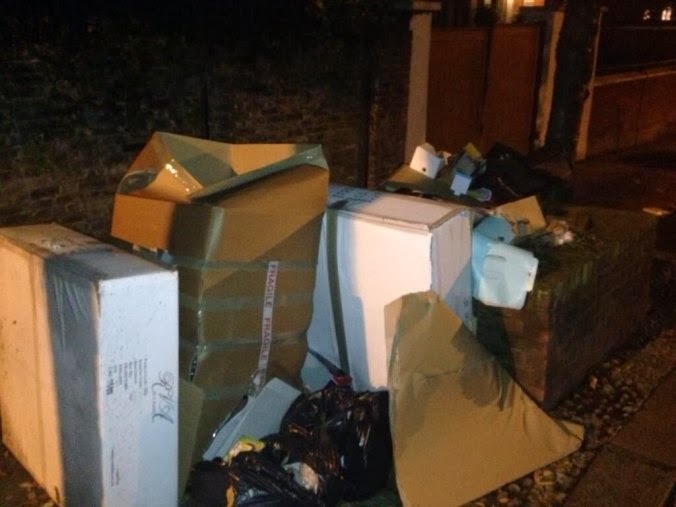 Of course the issue of rubbish has been the biggest concern for many residents over recent months – and could be a stumbling block for Labour locally in May’s council elections. The contract with Veolia is six months old and most people would agree that it isn’t running 100% smoothly yet. In response to some specific examples of local problems, Georgia said, “we kept our resources in-house to monitor the contract and educate. I appreciate it’s about behavour change; it will take time but we have resources to work with people”. She is still asking people to let them council know where there are issues. Which it seems is all some people who live in the worst-affected areas ever do. “There are still individual properties where we need to act,” said Phil, to which Georgia added, “You have to be proactive. There were clearly issues when it first was introduced, things have got better but there is still a way to go”. Although a lot of groups in the area cover both Fortune Green and West Hampstead (and sometimes the boundary between them is a bit unclear) Cllr Gould will be returning to look specifically at Fortune Green in the company of Camden’s only Lib Dem councillor, Flick Rea. 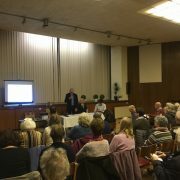 At local amenity group WHAT’s AGM last week, the thorny topic of rubbish was the theme. Following the departure of WHAT’s founder and long-time chair, Virigina Berridge, this was the first blooding of new co-chairs John Saynor and Mary Tucker. John opened the presentation by saying that most attendees were keen recyclers (hopefully true). 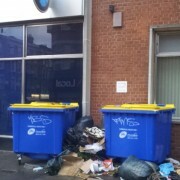 Therefore, is Camden’s main challenge to persuade those who don’t or won’t recycle to do a better job? Particularly in West Hampstead with a high turnover of renters. Richard Bradbury, Camden’s head of recycling, gave a fast, well-rehearsed presentation with many slides. 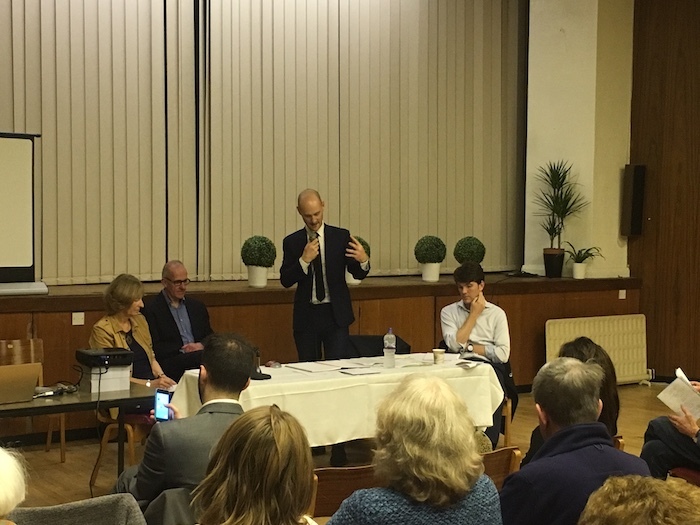 He emphasised that 85% of the contents of a Camden bin could be recycled, yet residents only manage 25%, which is pretty feeble whatever your political persuasion. 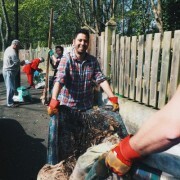 Richard proposed a outcome-focused plan to make the new rubbish contract a success: increased recycling, less fly-tipping, less contamination of recycling bins/better technology, educating the public, and flexible responses to specific problems. He handed out an update on what can be recycled. Then came a lively and productive Q&A session. From which we found out some of the details. We’ll get a leaflet telling us our fortnightly area dates for a whole year. People with babies need to pre-book extra nappy collections. We can now recycle black food trays. Shredded paper is acceptable, even though its fibres have been broken down. And there will be one-off collections for textiles and batteries (as well as large items), to be ordered via the website. You can recycle so much that it goes onto two pages! Technology to the rescue! There’ll be an app from which you can take photos of any problems and send to them to Veolia, the contractor. Vans will also have CCTV to check accuracy of collections with the footage saved for 3 months and to spot fly-tipping hotspots. The fly tipping penalty will be a fixed charge of £200 if Camden can actually get the right evidence. 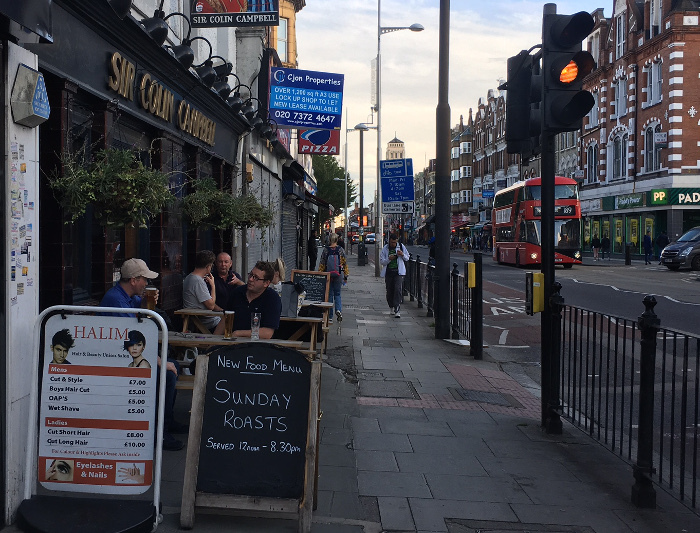 The whole thing sounded a bit “shop your neighbour”, though everyone at the meeting was too polite to say so – and maybe some neighbours deserve to be shopped? The representatives from Veolia were surprised by all the exceptions residents raised. For instance, they could only say they’d ‘look at ways to contain the waste’ in response to Solent Road’s bag-ripping foxes. If you can’t get your recycling – or any – bin on or next to your pavement you’ll have to ring up and ask for an ‘assisted service’. This will presumably mean Veolia would exeed its allotted 15.6 seconds per property – which translates as “one step in”. 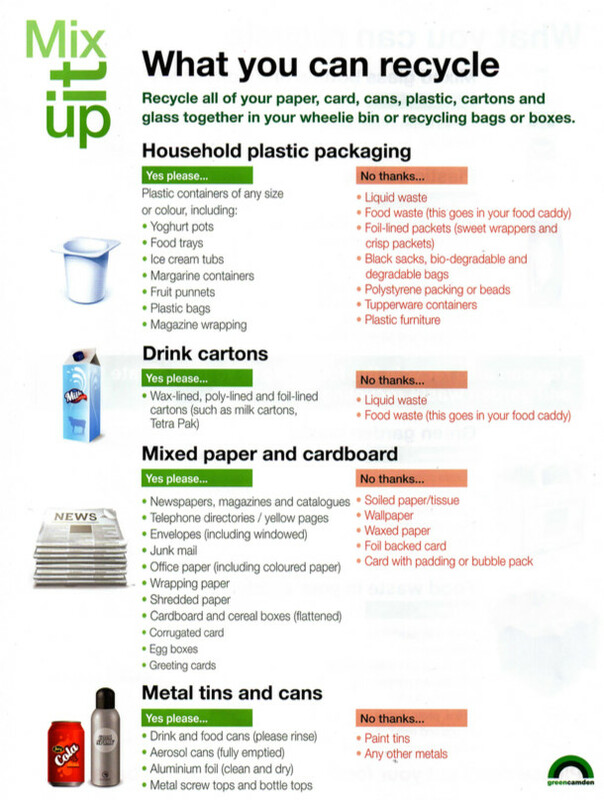 If you currently have green or brown wheelie bins you’ll have to get stickers if you want to use your bins. 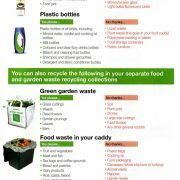 Green/garden waste will be collected weekly, but it’s £75 for a year or £60 for the nine months from spring to autumn. These collections (three sacks a week) can be shared with neighbours, but only if you pre-register. Pensioners will get a discount, though the details are still being decided. It’s strange to think that it was only a few years ago that we were getting bi-weekly rubbish collections, and soon we will have only fortnightly. West Hampstead already has a rubbish problem, with regular fly tipping, although time banded collections on West End have improved things. We will have to see how things change with the new contract from – and you couldn’t make this up – 1st April. 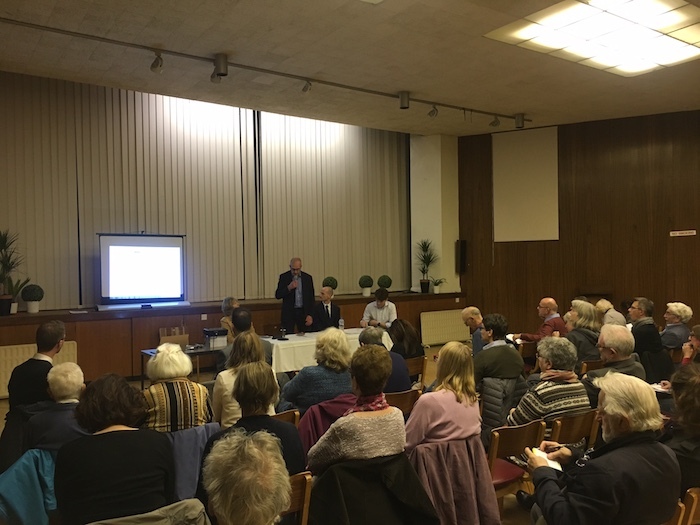 At last night’s public Area Action Group meeting in West Hampstead, the council gave plenty of stats on Camden’s waste and recycling. But the numbers that will have stuck in most people’s minds were “once” and “every two weeks”, as councillor Meric Apak confirmed what we reported in August; namely that much (though not all) of West Hampstead will move to fortnightly residual waste collections from April 1st. No joke. Recycling and food waste will still be collected weekly, and this is a clear attempt by Camden to both save money and boost dwindling recycling rates. On top of that, residents who want green waste collection will have to pay £75/year. Although the turnout last night was down on previous meetings (perhaps due to the tube strike), there was still a useful and lively discussion though there seemed little chance of the council and unenthused residents – at least those present – finding common ground. The facts are stark: Camden deals with 46,000 tonnes of domestic residual waste a year but only 26% of waste is recycled – a proportion that’s actually fallen over time. Yet Camden’s estimate is that 85% of household waste is recyclable. To prove a point, earlier in the day, Richard Bradbury, head of Camden’s Environmental Services, had collected 17 bags of domestic waste from West Hampstead properties. He didn’t go so far as to bring them with him to the meeting, but he had sorted these 17 bags into 5 bags of recyclable material, 4 bags of food waste and just 3 of residual waste. Five bags fewer in total, and only three of the 17 should have been heading to landfill (an 82% recycling rate). In 2011/12, Camden residents recycled 33% of their waste, so why has this fallen to just 26% today (about the same level as in 2004), especially after the new green wheelie bin regime was introduced in 2012 to make recycling easier? Camden’s target for 2020 is 40%, but to reach this, the council is relying on an awful lot of stick and not much carrot. Camden is not alone – just over half of London boroughs have seen a decline in recycling rates over recent years. The hope is that fortnightly collections will encourage people to recycle more as recycling will still be collected once a week. We shall see if that happens. 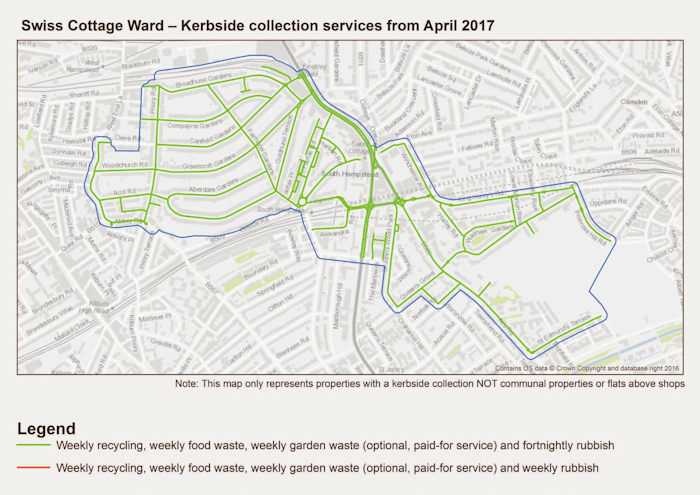 Importantly, not all streets will move to fortnightly collections – only existing kerbside collections are affected. The maps below will help most people, but for precise details, contractor Veolia has a very useful and clear search function so you can see how you’ll be affected. 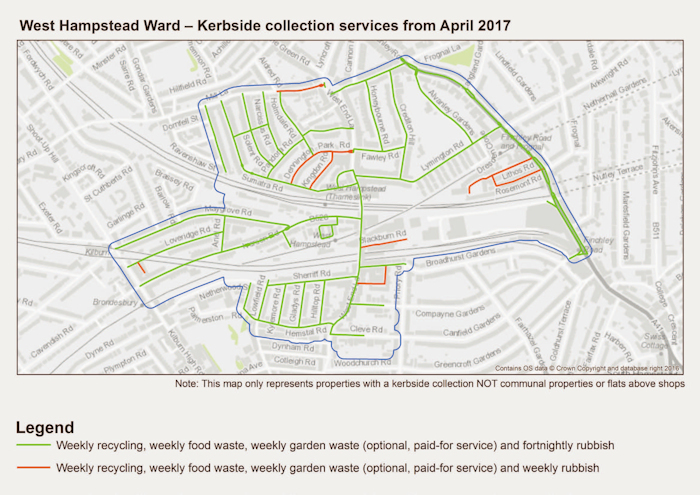 In West Hampstead and Fortune Green, some streets will still keep weekly collections. 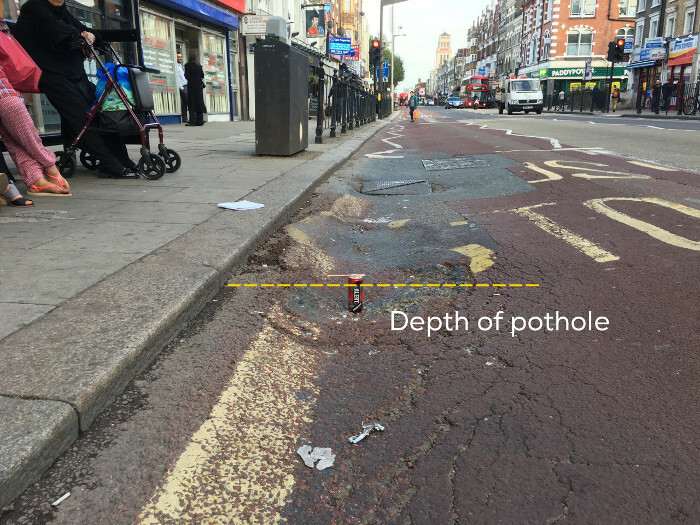 This is usually related to housing density and availability of space for bins. 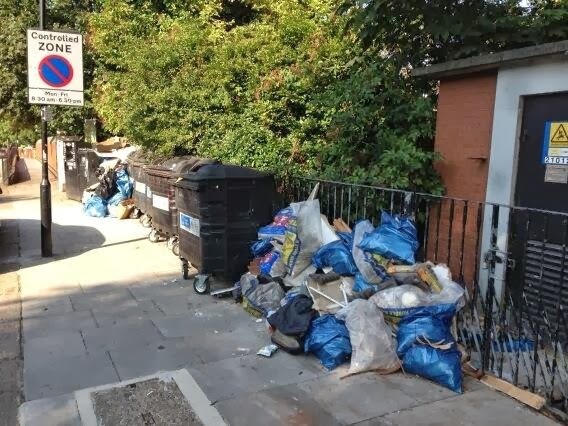 On the commercial strip of West End Lane, rubbish will still be collected daily, with residents being given enough bags for up to two collections a week. 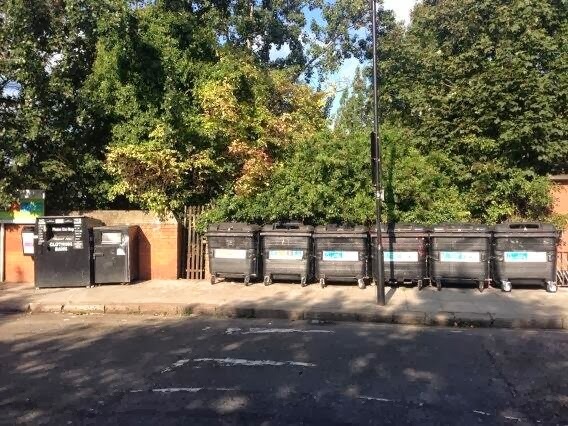 All the streets in South Hampstead will move to fortnightly collections. Alongside the change to fortnighly collections, there will be (yet another) crackdown on fly-tipping with more investigation. 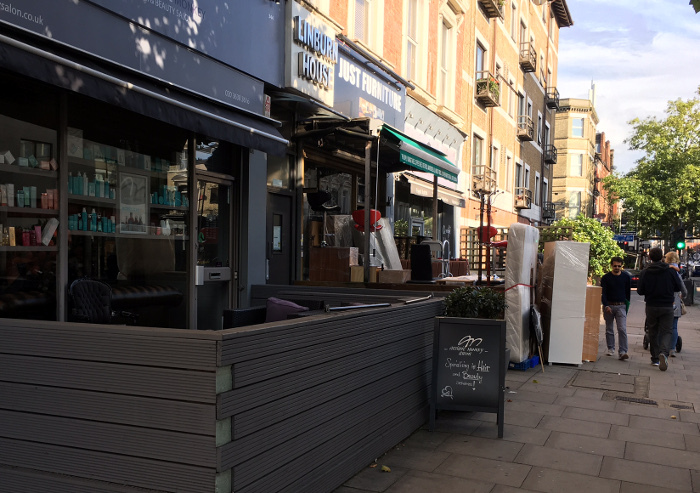 The council clears 2,000 tonnes of fly-tipped waste a year (of which surely at least 1,990 tonnes comes from West Hampstead). The bin men won’t take black bags that don’t fit into your bin (in fact they’ll photograph them for evidence so when you ring up to complain they’ll tell you you exceeded your allowance), and apparently there’ll be a lot of ‘education’. 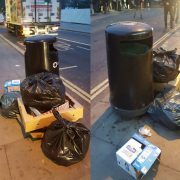 Fortune Green councillor Flick Rea wondered what will happen when Christmas comes around, or a birthday party, or someone moving, all of which generate extra waste. Residents will also receive new black bins. There are a tonne of caveats and other minor changes. For example, there’ll be a free weekly nappy collection service available to households with children under the age of 2 1/2 who wear nappies. Read all about them on Camden’s website. Questions from the public included whether Camden would be checking our waste (Camden wearily said “no” several times) and under what legislation we are required to recycle, the answer appeared to be none, though frankly – economics aside – it shouldn’t take legislation to get people to want to help minimize landfill. Some residents also pointed out that if Camden wanted to increase recycling it would help if it made it easier. There is also a contradiction between Camden’s policy of reducing car ownership and car use and the regular refrain of ‘you can take it to the Regis Road recycling centre’, when anyone enquires about recycling something slightly out of the ordinary… like a toaster. What are your thoughts on this? Good incentive? Unworkable? Open to abuse? Time for people to take some responsibility for the environment? Let us know in the comments. It’s the middle of the summer holidays and Camden Council has announced (controversial) changes to waste collection. It’s yet another change after several over the past few years (e.g. switching from multi-stream to single stream recycling). But despite all these changes recent performance in terms of recycling has been poor. In 2005 Camden beat the target of 25%, achieving… 25.2%! Woo hoo. Ten years later by 2015 this had crept up to… 26.3%, still well short of the 2020 target of 50%. That target is, however, an EU target so perhaps we should expect revised targets at some stage? However, at the current rate of improvement, 1% per decade, Camden is on course to reach the 50% target by 2255! 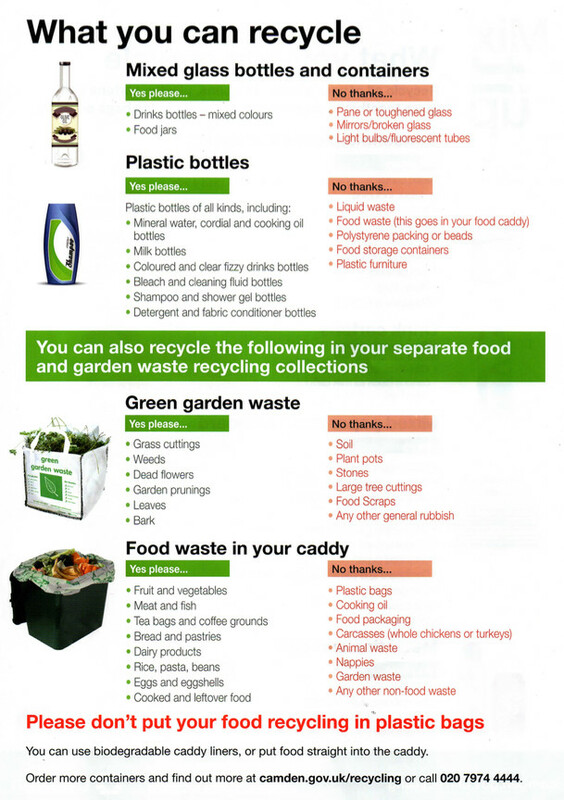 Changes to waste collection and recycling? Camden ranks 333rd out of 352 councils across the country and 25th out of 32 among London councils for recycling. The councils at the top recycle 65% or more of their waste and even in London the best manage more than 40% (Ealing: 40.1%, Harrow: 45% and Bexley with an impressive 54%). At least Camden is doing better than Newham and Lewisham, both on 17%. 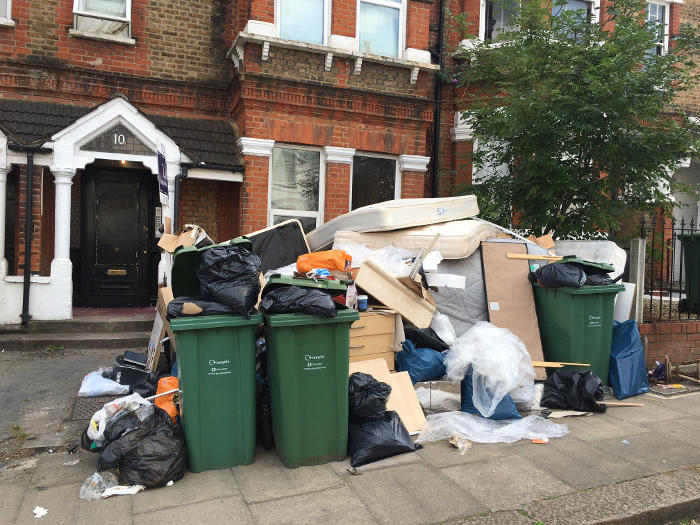 To up recycling rates – and to save money – Camden is proposing that ‘some households’ will switch to fortnightly rubbish collections of ‘residual’ waste. 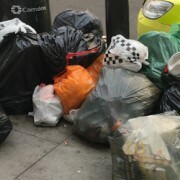 It is yet to specify which households this will affect, though it is understood that the south of the borough will still have weekly collections. Houses that have the space will be given a black wheelie bin and those that don’t will be given branded sacks. The Council will maintain weekly collections of food waste and dry recyclables across the borough. The theory is that this will encourage more recycling. 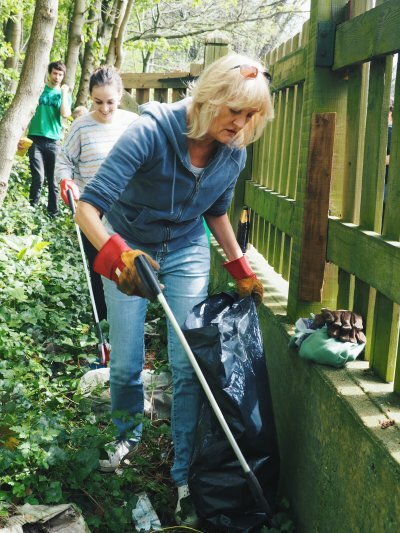 For those locals with gardens, Camden is introducing a charge (or tax as the local Tories have labelled it) for collecting garden waste: £60 for a nine-month ‘service’ and £75 for a 12-month ‘service’. It seems odd to discriminate against green waste; people are doing the right thing, flats and houses with gardens could well be in higher council tax bands already, and charging to dispose of green waste is likely to lead to more people simply disposing of the waste in the black bags (this will apparently be penalised, but it’s hard to see how). It could even lead to more gardens being paved over – not exactly part of the Green agenda. 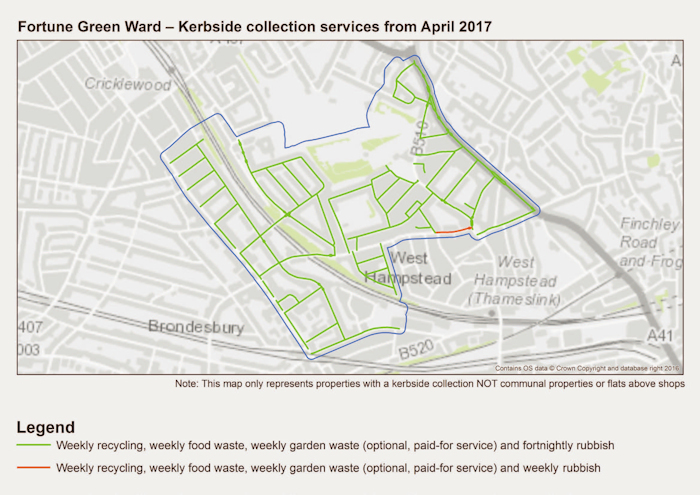 Residents can take garden waste free of charge to Regis Road in Kentish Town or Hornsey Street (in Islington) but neither are local to West Hampstead and more car journeys is hardly environmentally friendly either. Moving to fortnightly collections of general waste could lead to more fly-tipping – it’s certainly unlikely to lead to less. 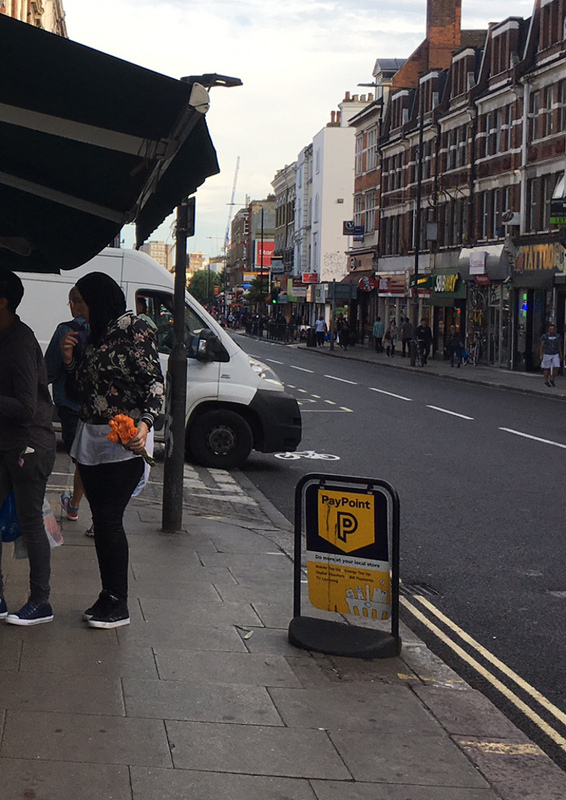 Fly-tipping and the poor state of our streets is already a serious problem in West Hampstead and was the number one issue raised in research for the NDP. There is a petition about the changes, but it has only had a few people sign it so far. 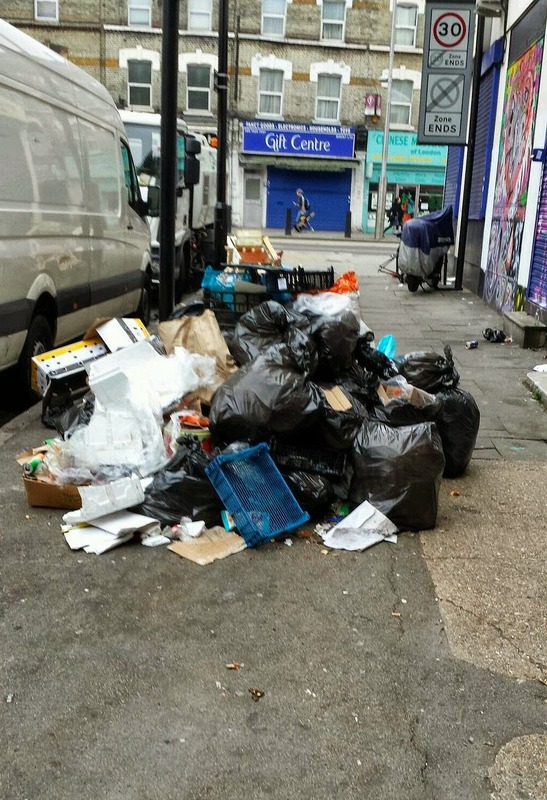 As the recent improvements to rubbish collection on West End Lane have shown, some parts of Camden Council are making progress and are effective at keeping the area cleaner. But if the challenge is to raise recycling levels and make Camden a greener, cleaner borough, it’s hard to see how these changes will achieve that. 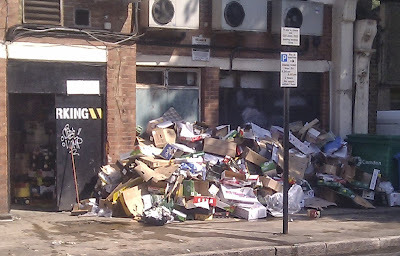 No, not a slipping of standards, but an article on something dear to your hearts: rubbish on West End Lane. 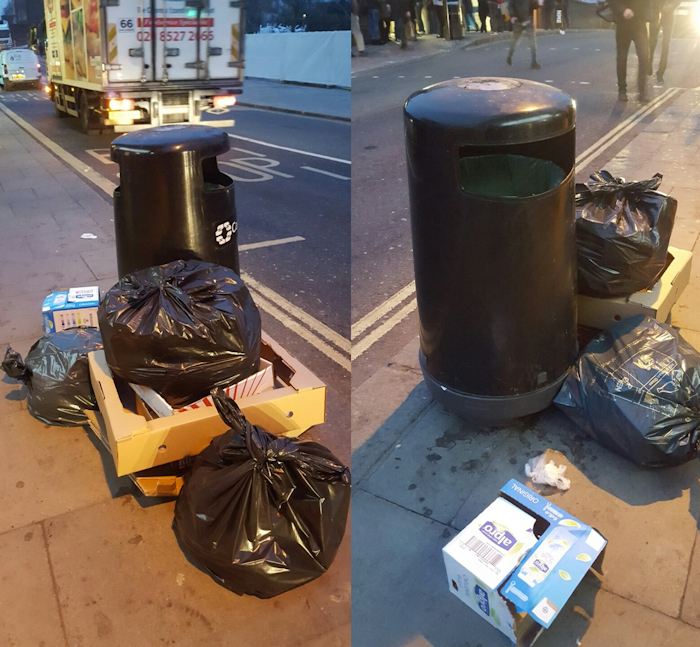 The amount of rubbish on our busy commercial streets was an issue raised repeatedly at Neighbourhood Development Forum meeting, but fell outside its scope. And the saga of the Sainsbury’s bin, remember that?, also captured the strength of local feelings. 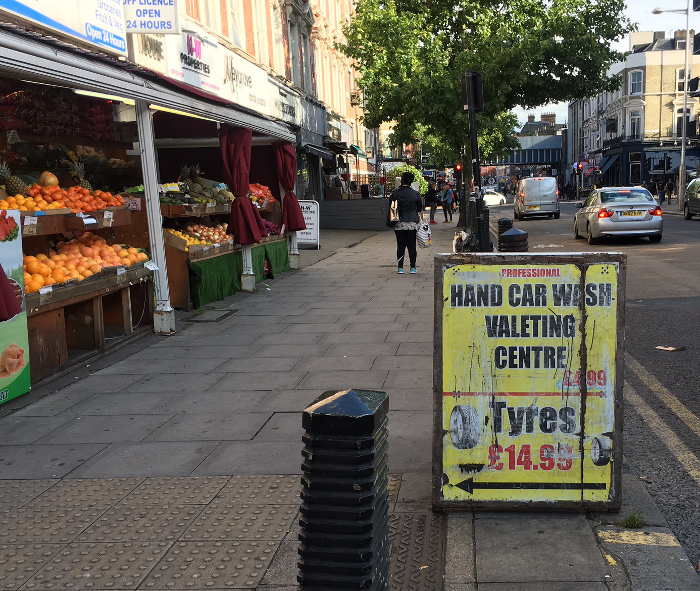 In a bid to clean up West Hampstead, Camden Council is introducing time-banded collections on the commercial parts of West End Lane and Fortune Green Road (but not Mill Lane, yet). From the 6th June, commercial and residential waste can be put out only at certain times and will be collected shortly after. Twice a day on West End Lane and three times day on Fortune Green Road. 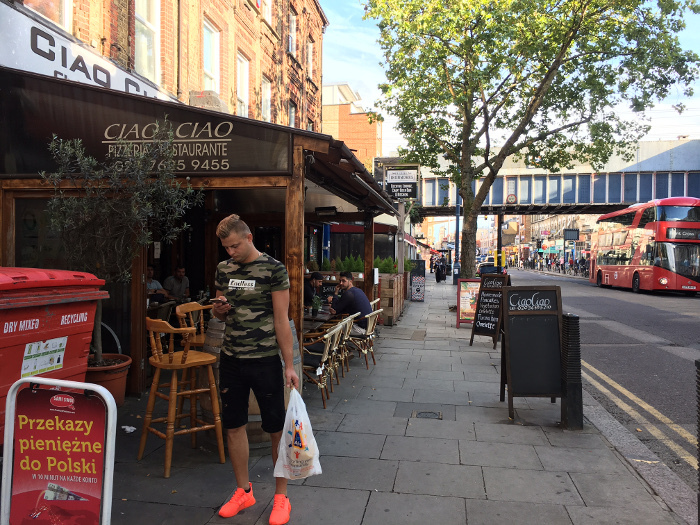 Camden has told businesses and residents this is happening and has liaised with private contractors about it. The hope is that this education campaign, and the fact that it is their own best interests, will persuade businesses and residents to get in the habit of disposing of their waste correctly. Camden is taking a zero-tolerance approach and will issue fixed penalty notices to offenders but really hope that this is not necessary. 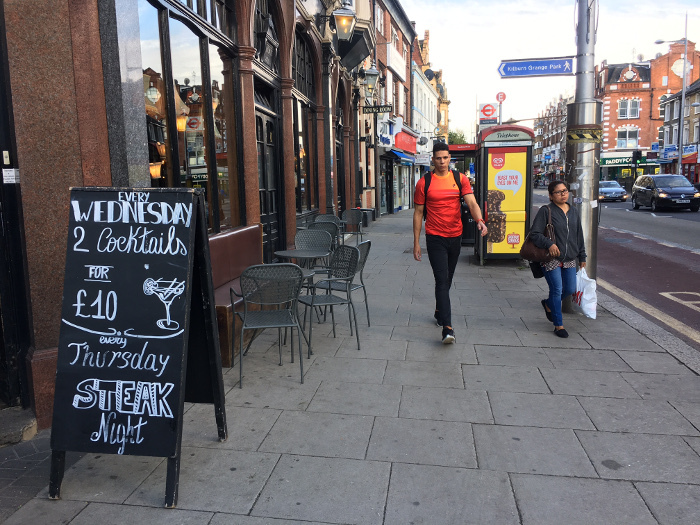 Time-banded collections are used elsewhere across the borough (Camden High Street, Kentish Town Road, Hampstead) to manage the problem of litter on busy commercial/retail areas, which are also residential areas (particularly with flats above shops). 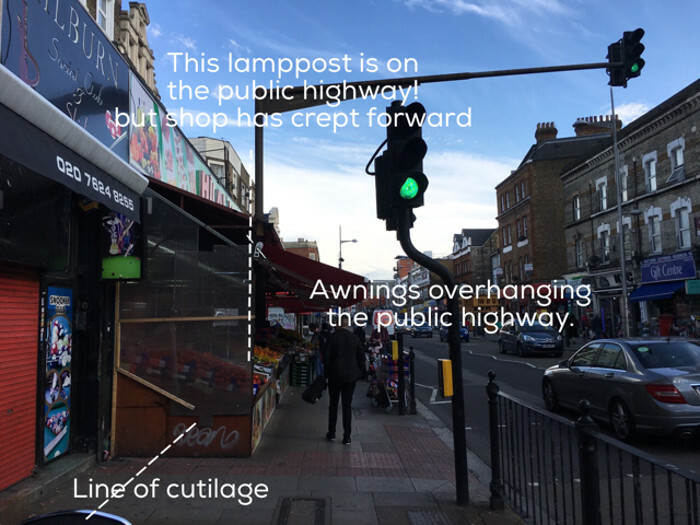 It seems to work elsewhere, so we are hopeful that introducing it on West End Lane and Fortune Green Road will improve the litter and fly tipping situation. Blackburn Road has its own problems. Will Camden extend the scheme? The cause of the rubbish problem on our main streets is two fold, firstly commercial waste, which is generated by local shops and businesses. 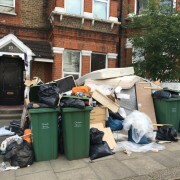 This can be collected by a number of contractors, not just Camden Council, which has little control over when other licensed waste collection companies collect their waste. So it could be there all day. It is also possible that some businesses are trying to avoid paying for waste collection and are just dumping their waste. That said you would think there was a fairly strong incentive for businesses, as they would presumably prefer their customers didn’t have to wade across mountains of trash – it is not really conducive to a pleasant retail environment. 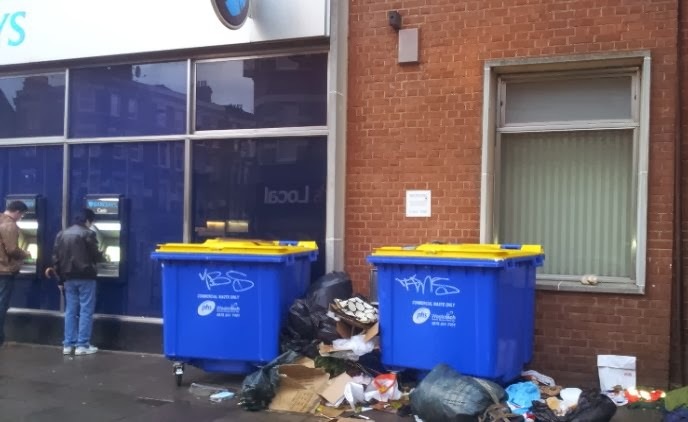 Second problem, flats above shops generally lack any outside bin to store waste until a regular weekly collection (unlike those who live in purely residential streets). Residents therefore tend to leave tied-up supermarket bags of rubbish at random times of the day, seven days a week. These bags also seem to contain a large proportion of potentially and easily recyclable waste (bottles, can and plastic) which if recycled at, for example, the West End Green recycling centre, would reduced the amount of rubbish. Camden recycles 26% of its waste (by which of course I mean our waste) which is well short of the target of 40% by 2020. The North West London Waste authority NWLA, of which Camden is part, has an even higher target of 50% by 2020. Here’s hoping for a cleaner and greener West Hampstead Life. If you’ve ever had cause to walk from West End Lane to Kilburn High Road via Sherriff Road, you will have been on Netherwood Street. You probably hurried by trying not to notice the unsightly dump between the pavement and the railway line. All manner of refuse, including builders waste and evidence of rough sleeping, combine to give this otherwise pleasant area a distinctly grotty feel. 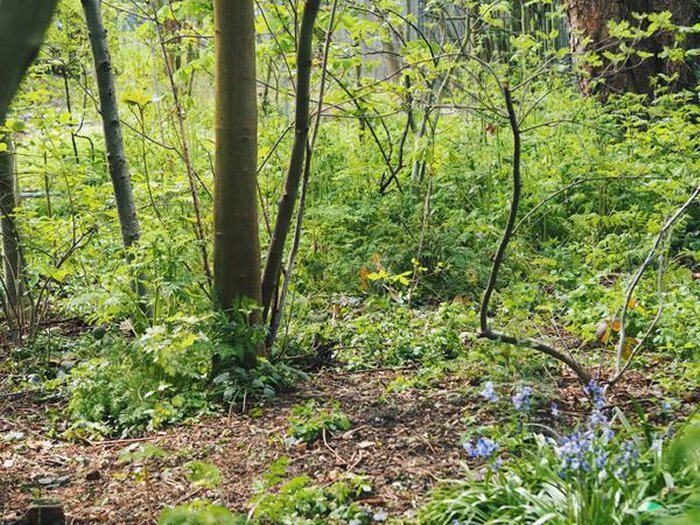 WHGARA, the local residents association for that part of West Hampstead, has decided to reclaim this abandoned council-owned site, and turn it into a small park. Cllr Phil Rosenberg, who ran a very informal consultation on rubbish hotspots in the area via West Hampstead Life, took Cllr Sally Gimson, who’s responsible for such things in Camden, on a walkabout to see the worst offending places – including Netherwood Street. 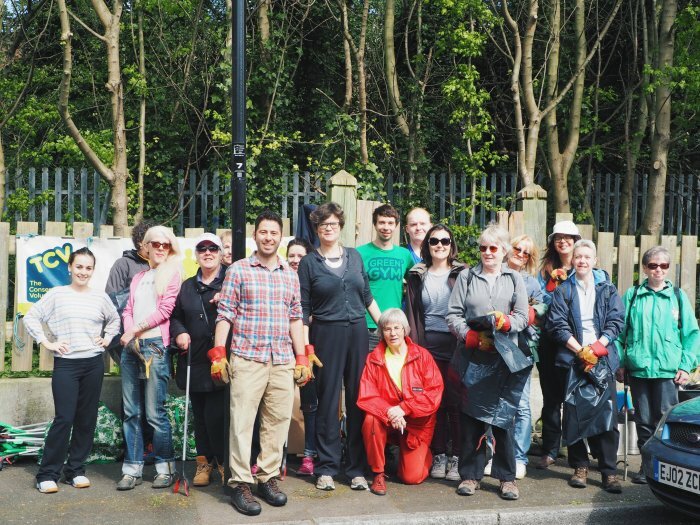 Camden was able to bring WHGARA together with local charity, Camden Green Gym, and national campaign CleanUpUK to make a difference to the area. The three groups joined volunteers from the Webheath estate, and the two councillors to clear the site earlier this month. 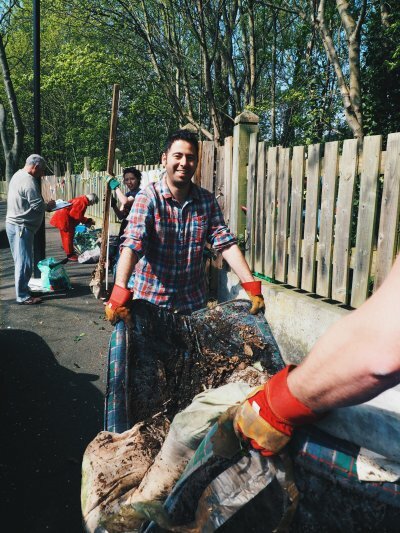 Working for three hours, the 20+ volunteers moved heavy debris including mattresses and discarded builders’ material, and more than 50 bags of flytipped waste. 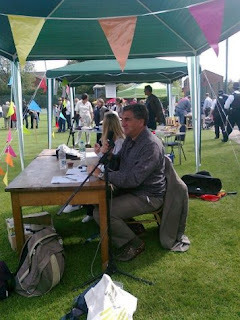 WHGARA secretary Brigid Shaughnessy said, “It was a real success. The community really rallied behind it and we are hopeful that it can be restored as a creative new green space for residents”. 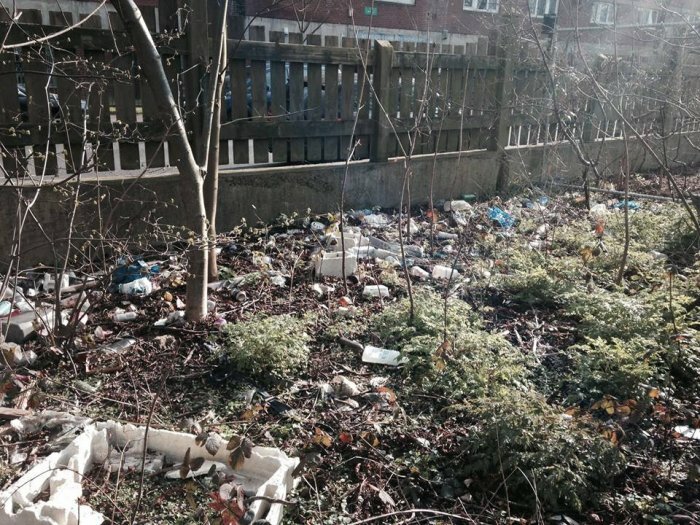 Once the space is cleared of waste, campaigners hope to turn the plot in to a micro-park, and the possibility of new allotments is being discussed. Ms Shaughnessy paid tribute to the “sustained and positive support” of the councillors, which had helped get the clean-up off the ground. The campaigners are hoping to do another round on the weekend of May 9th/10th, which we’ll publicise on these pages – do get involved in what’s a great community initiative. 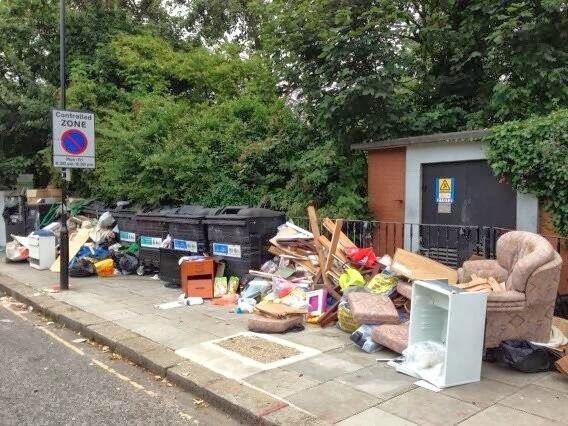 However, Camden has a long way to go to win over residents who are dissatisified with the rubbish on our streets (especially the Kilburn High Road end of Netherwood) and the performance of contractors. This feels like a step in the right direction, though hopefully not every initiative will require residents to become quite so closely acquainted with the problem they want solved! 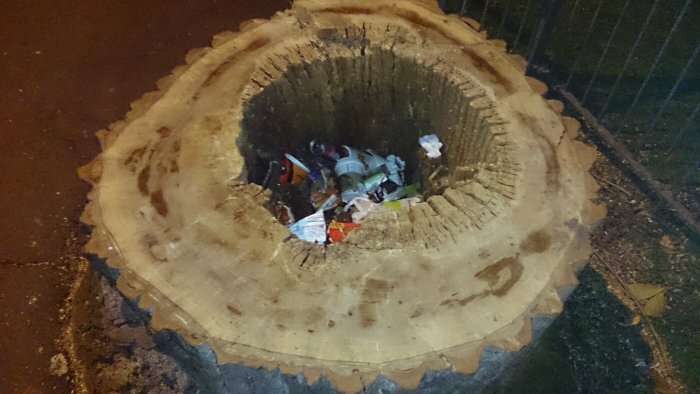 Camden council, clearly stumped by how to solve the continuing problem of litter in our streets, appears to have decided to combine its tree-removal program with an increase in the number of bins. Fly-tipping crackdown, but what about the bins? 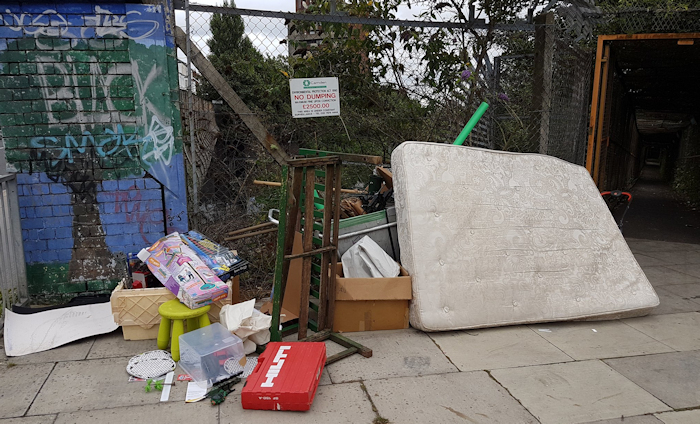 Whether it’s due to all the local twitter and website activity, or whether our councillors have managed to put the squeeze on Camden, we finally have some action from the council on the fly-tipping blight. But what about the problems being caused by the normal rubbish and recycling collection (or lack of it)? We’re taking a tough approach to those people who continue to litter, dump their waste or do not clear up after their dog. We know that you find littering, dog fouling and fly-tipping disgusting and anti-social. Through our Clean Camden campaign we want to change this bad behaviour through education and enforcement. We need you to help by being our eyes and ears and reporting issues to us so that we can crack down on these filthy enviro-crimes. Ignoring the crime against language that is the phrase “filthy enviro-crimes”, lets think this through. 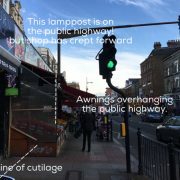 Some have already dismissed the scheme as Camden passing the buck onto residents, expecting us to be on constant alert for someone carrying a mattress down Mill Lane, or surreptitiously dumping bags of construction waste on Minster Road. Oddly enough, quite a lot of these activities seem to happen under cover of darkness – almost as if the perpetrators didn’t want to be seen? I know, right? @camdentalking @WHampstead So basically you’re just asking for us to grass people up, which we’re already doing. You need to be proactive! It’s not unreasonable to ask for some cooperation from Joe Whamper; we understand the budget constraints (even if Labour’s political opponents argue the council has its priorities wrong) and enforcement teams can’t be everywhere. However, realistically, catching the big offenders is going to take more targeted action. Is that more expensive? Yes. That’s why it has to be targeted. But we all know where the stuff is being dumped; and as dumping is illegal and comes with a fine, there’s even some way to recoup some of the cash – sort of how parking enforcement works. I’m not clear what the education element is here – yes, maybe there are some people who don’t realise they shouldn’t put a mattress out in the street, but the biggest “fithy enviro-crimes” [shudder] are committed by people who surely know all too well what they’re doing. Less education, more enforcement please. The fine for littering and for not clearing up after your dog is £80. The maximum fine for fly-tipping is a slightly staggering £50,000, though as I reported, Camden very rarely prosecutes. If you do happen to see someone furtively leaving an armchair lying around or, as Camden puts it, “if you spot a place or person that is undermining our attempts to rid the borough of dog fouling, littering or fly-tipping”, then you can ring 020 7974 4444 (that’s the standard Camden contact number) or report them online. 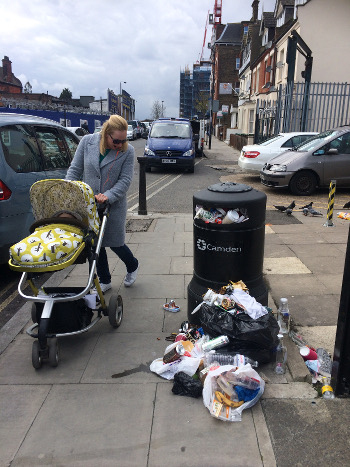 Camden’s also going to be “calling on residents to take part in and organise clean up events.” I think many people will be telling Camden into which bin they can stick their clean-up events. 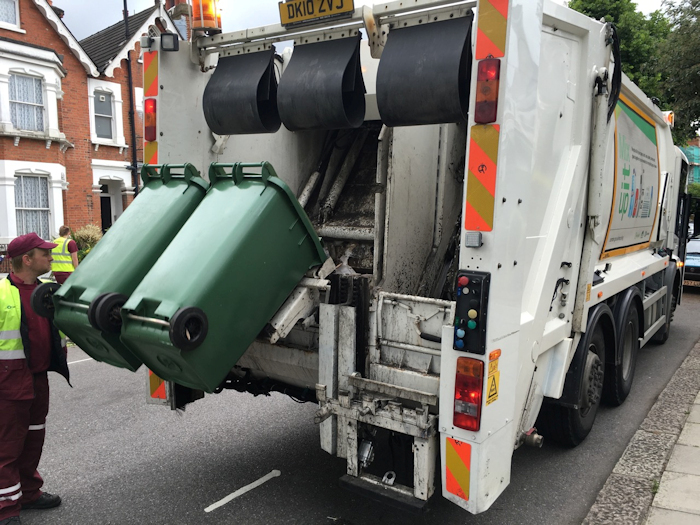 Residents may not be aware that businesses have to make separate arrangements for waste collection – their business rates don’t cover this in the way that council tax does for domestic waste. Instead they have to make their own arrangements (and pay for them) with registered waste collection companies.They must also “stop waste escaping from [their] control, by storing it safely and securely.” There have certainly been examples of waste around West Hampstead that is clearly business waste – either from construction projects or restaurants. The latter should be reasonably easy to identify (and they are unlikely to dump it outside their own premises). Larger items that do not form part of business’s day-to-day waste can be collected by the council for a charge. 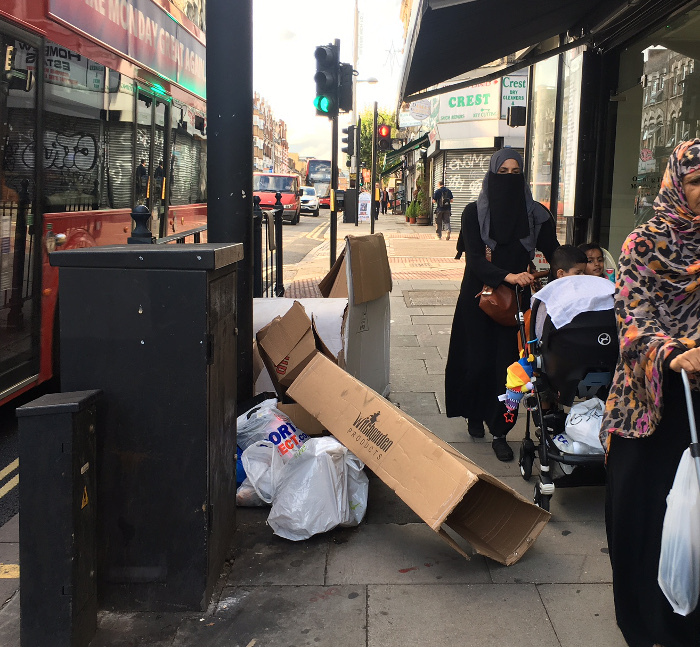 While the Clean Camden campaign is a small step in the right direction for countering littering and fly-tipping, there is another problem. At least in this part of the borough, the rubbish and recycling collection is far from perfect and this is creating problems too. When the bin men don’t collect the rubbish and bins or bags are left on the street, it’s both unsightly and unhygenic, but also gives the impression that this is acceptable behaviour. Solving the area’s rubbish problem needs both action on the fly-tipping and action on Veolia (the contractor) to improve performance. I can imagine this is happening behind the scenes, but I think locals would like to hear a bit more about that – including what sort of penalties Camden can impose on Veolia if it misses targets (surely it has targets?). The introduction of the wheelie bins combined with changed collection days and new recycling arrangements (co-mingled recycling) impacted negatively on the service. Complaints rose significantly, as anticipated, in line with experience in other boroughs, as the Veolia staff didn’t know the rounds and were dealing with a new system. This should now have settled down. I can tell you that we are on track to make our anticipated financial savings and are already seeing increased levels of recycling. Aside from the fact that it really shouldn’t take more than a couple of weeks to get familiar with new rounds, this doesn’t address the problems that locals are reporting every week about missed collections, or simply missed bins. Worryingly, fly-tipping actually includes putting out a bag of rubbish when it’s not a refuse collection day. So, if you put your bin out and it’s not collected and you’re away, you may find yourself accused of fly-tipping! 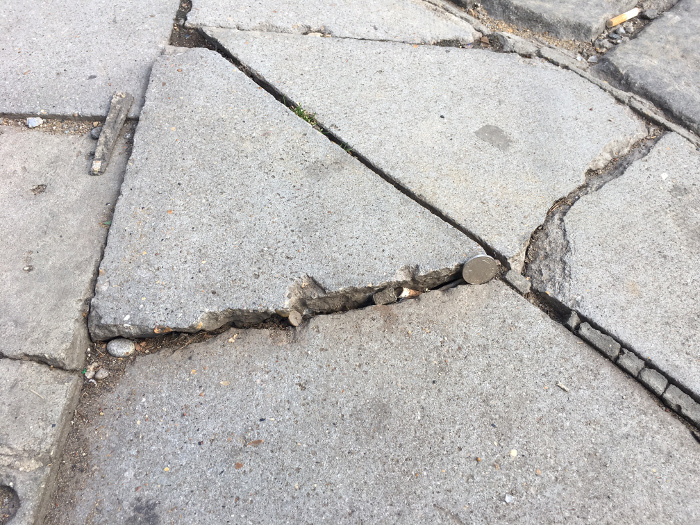 To find out more about Camden’s new crack-down, come to the Area Action Group meeting next Wednesday when one of the street environment officers will be explaning more – and probably copping some flak. Street cleansing budgets were cut 40% due to the £83.5 million of cuts targeted at Camden by the coalition government (far higher than richer, rural areas). This means streets are swept less often that they used to be. Additional money for street cleansing must be taken from other services. The council is now expecting £70 million of additional cuts to be found over four years from 2014/15 due to further extra cuts targeted at Camden by the coalition government (again far higher than richer, rural areas). The extra cuts will be front loaded and will have a big impact on services from 2014 onwards. Street environment services staffing has been revamped in the last few months. The objectives included a) creation of a new education and enforcement team, b) increasing the skill levels of staff, c) improving contract management of Veolia. This meant that some staff were made redundant, others were demotivated for a period, and new staff had to get used to their roles. This process also had a negative impact on the services provided but is also now nearing completion. Officers should be responsive to problems and respond when issues are identified. 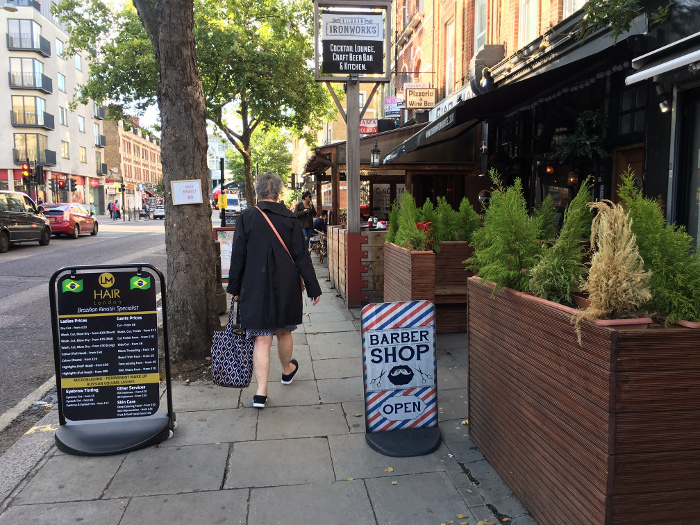 We are launching a new ‘Clean Camden’ enforcement campaign on 6 November. This will target fly tipping, dog fouling, littering etc. Officers will be targeting hotspots to fine people caught doing any of these environmental crimes. It will not stop these problems from occurring, so it is important to be realistic. It should highlight the unacceptability of such actions and send a warning to those who flout the law. We also need to gain more evidence on who is committing these crimes so people will be encouraged to send information to the council. This last point is encouraging for people who are sick of their streets being strewn with debris. I think it’s easy to understand that budget cuts will have an impact on all manner of services, but when there are already laws in place that are meant to prevent some of the resulting problems, it seems strange that it takes a special initiative to enact them. 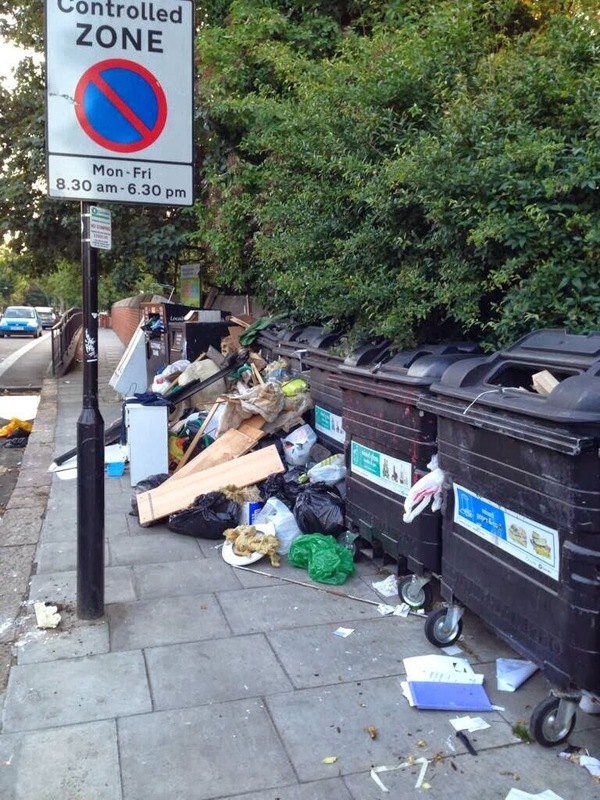 Over the past few months, rubbish has been the overriding issue in West Hampstead. 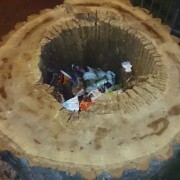 First, there were teething problems with Camden’s new recycling and rubbish collection system. 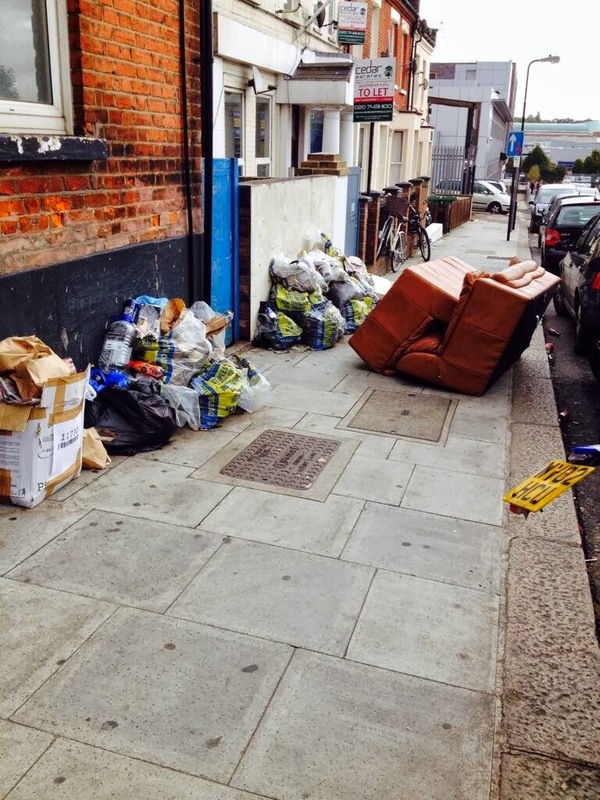 The problem now – and what a problem – is fly-tipping. Camden has signs around the area threatening prosecution, but those seem to be idle threats and the problem’s getting worse. This sort of “industrial-scale” waste is completely unacceptable. This looks like house clearance and builders’ waste material that they should be paying to have taken away, or drive to their nearest dump. Netherwood Street in Kilburn also suffers from business waste problems – this is nothing new, the day Kilburn flooded last summer, I took this photo on Netherwood Street. 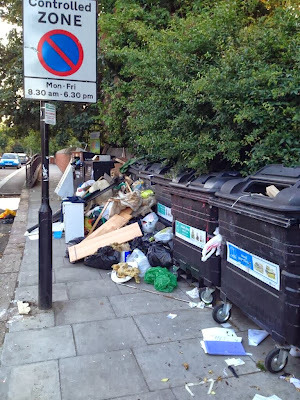 Yet when a resident asked how many fines or prosecutions have been taken forward by Camden Council under the Environment Protection Act 1990 (as featured in the sorry ‘No Dumping’ sign), in Kilburn ward over the last few years, he was told ZERO. One of the knock-on effects of the large-scale fly-tipping is that people… locals… start to think it’s acceptable to leave single items outside. The Guardian recently published an article and accompanying map of fly-tipping at the council level. Camden fared fairly badly placing 11th on the list of total incidents per 1,000 people, and 12th on the overall total (Newham and Southwark fare much worse). More interesting than the map is the data on actions taken. Nationwide, only 0.5% of incidents result in prosecutions, despite the fact that the success rate of those prosecutions is 99%. 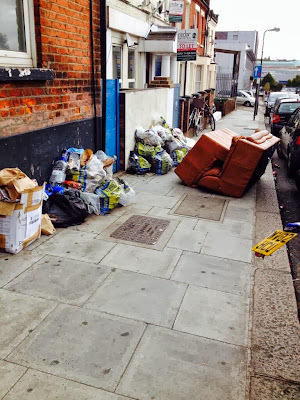 There are probably no easy answers – maybe the refuse people don’t care or they’re trying to do too much in too short a time, maybe they aren’t properly supervised either by their own bosses or by officers in Camden who are supposed to monitor the contract. Also it seems lots of people just don’t care where they leave their rubbish – smelly old mattresses, broken chairs etc. 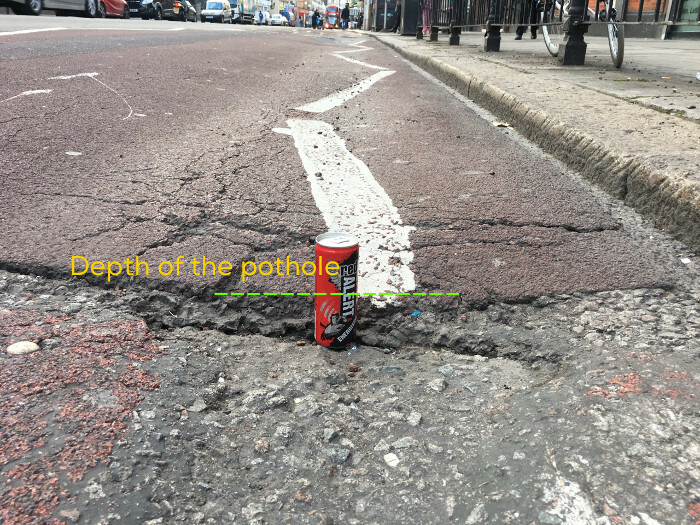 Whatever the reasons – our streets are definitely a mess! 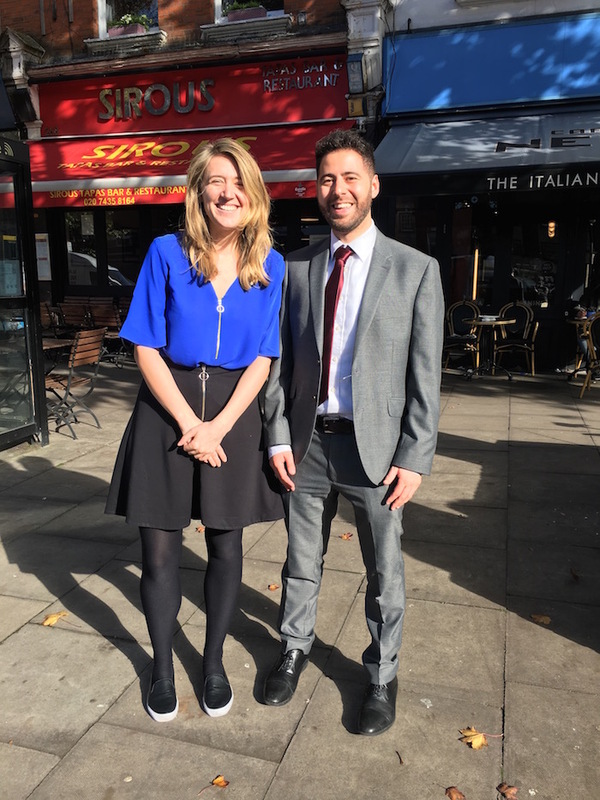 Camden’s Street Environment Services have been re-organised, recruited new staff and hope that when they are all in place, things will improve and our streets will get to look a bit cleaner. Lets hope so. Like all councils, Camden is strapped for cash at the moment, and street cleaning/refuse collections are often in the firing line for cuts. We should be thankful that we haven’t been reduced to fortnightly collections. Nevertheless, when there are so many flagrant fly-tipping abuses, it seems that a concerted effort to prosecute would help clear up the problem (and pay for itself in fines). Meanwhile, if it’s all getting too much for you – never fear, Boris is here. The golden-haired mayor recently helpfully suggested we should all pitch in. I’m all for a bit of community involvement in clearing up after ourselves, but I don’t think I can lug 20 bags of building material off to the tip thanks all the same Boris.